Barrie Colts 2018 NHL Draft Prospects: Kai Edmonds. #OHL #NHLDraft - Very Barrie Colts | A website covering the Barrie Colts of the OHL. Kai Edmonds was rated as a 'C' level player (4th round or later) during the NHL Central Scouting Players to Watch list in November 2017. However, Kai was not ranked in the mid-term or final rankings by NHL Central Scouting. Edmonds was selected 116th overall (llth round) by the Barrie Colts in the 2016 OHL Priority Selection. He was undersized at 5'10" and 142 lbs., but put up really strong numbers for the Cumberland Grads Midget AAA program (1.77 GAA and 0.927 SV%) and the Colts took notice. After the draft, he was invited to the 2016 OHL Gold Cup, where he won a bronze medal (posting a 2-1 record with a 1.65 GAA and .952 SV%). The bronze medal game went to a shoot-out, and he shut down all four GTHL shooters faced. The shooters he stopped were: Declan Chisholm, Jack McBain, Liam Foudy, and Allan McShane. All four players are top prospects for the 2018 NHL Draft and were highly touted coming out of minor midget. Edmonds spent the next season with Westminster Prep in Connecticut, USA and again posted solid numbers (2.57 GAA and 0.903 SV%). Kai Edmonds was signed by the Barrie Colts on June 19, 2017 and made the team for the 2017-2018 season. The Colts traded Christian Propp to make room for Edmonds as their back-up goaltender behind veteran Leo Lazarev. Once Edmonds made it to the OHL, he grew considerably and measured in at 6'2" and 162 lbs. He continues to show strides in his physical maturity and has plenty of potential for an NHL team willing to take a chance on the Carlsbad Springs, Ontario native. 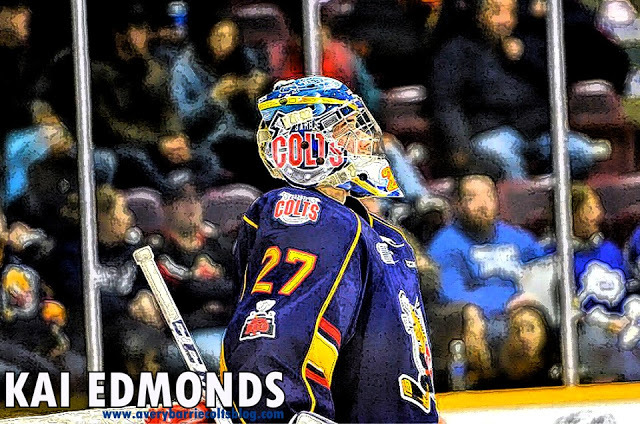 In his first season with the Barrie Colts, Kai Edmonds posted a 9-4-1 record, with a 3.48 GAA and 0.888 SV%. Kai won his OHL debut game on November 11, 2017 in Ottawa. This must have been a great experience for the young net-minder, who is an Ottawa area local. Video highlights from that game are below. Kai Edmond's had his best performance of the season on February 25th, 2018 in Owen Sound against the Attack. He stopped all 48 shots faced en route to a 4-0 shut-out victory. His talent was on full display and he had a great game manning the crease for Barrie. A link to the highlights of this game are below. Kai Edmonds displayed a good skill set over his first season with the Barrie Colts. He proved that he can steal a game during his 48 save shut-out victory against Owen Sound. It's important to note that Kai did not get into many games during the year. The Colts used veteran Leo Lazarev a lot during the 2017-2018 season, therefore Edmonds got limited chances to make an impression on NHL scouts. When he was called upon, he showed that he has the ability to be an impressive starting goaltender for Barrie next season. Edmonds has strong positioning, quick reflexes, and solid rebound control. It will be interesting to see if he hears his name called on June 22-23, 2018. Many Colts fans will not be surprised if he does, and the best is yet to come from this young NHL prospect. Date of birth: July 27, 2000. Place of birth: Carlsbad Springs, Ont.